Gilbert's #4613 set, made in 1946 and 1947, had the 322 Hudson locomotive and the rare long-truck painted Pullman cars. The #4613A, made only in 1948, had the 322AC Hudson locomotive and the somewhat less rare (but still very hard to find!) short-truck painted Pullmans. What I have is a cross between the two: the 322 with the short-truck Pullmans. I got the 654 painted observation car as a kid and have wanted to complete the set for over fifty years. In September of 2004, I finally succeeded! This is the #654 observation car I got as a kid. 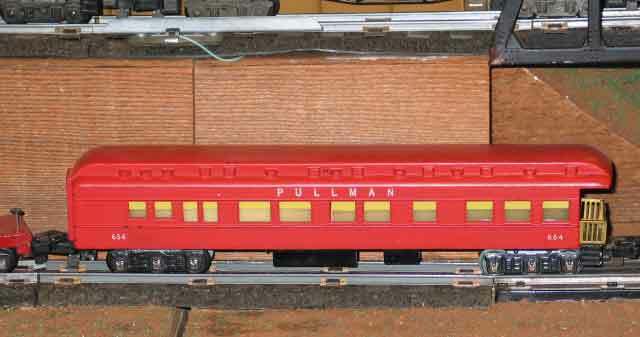 I got this #654 observation car with the set, but mine is in better condition and has sentimental value. This gallery will continue to grow and become more comprehensive as I collect more cars and as visitors send me pictures of the cars I don't yet have. If you have a car that you would like to share with the world, email me a picture: theupstairstrain@yahoo.com. Click here for a list of the pictures I need to complete the Gallery.